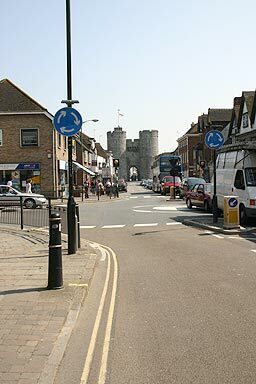 Turning left here will take you to Canterbury's West Station supplying train services to Margate on the coast or inland to Ashford. From Ashford, you can travel to London or take the Eurostar trains under the tunnel to France. The station was built in 1846 creating the North Kent Line of the South Eastern Railway. The new line crossed George Stevenson's Canterbury and Whitstable Railway and that was diverted into the newly built station. The roundabout appeared in the last two years, and traffic routing to the East can now avoid the congested junction at the Westgate. On the left just past the junction is my favourite travel agents: Brockman's Travel, who are unfailing helpful when it comes to arranging journeys away from Canterbury. A little further down is Forbuoy's Newsagent whose staff deliver papers to my house every day.